You can find Ayton Community Hall up the vennel next to the Hemelvaart Bier Cafe (previously the Black Bull pub) on the High Street. It’s only been the Community Hall since the end of March 2008. Prior to that, the hall was owned by Ayton and Burnmouth Church. The Church was finding the upkeep of the hall quite difficult and planned to sell it at some point. A group of local villagers became aware of this and decided that, if possible, it should be purchased and upgraded to benefit the whole community. A village meeting was called in February 2005 and at that meeting Ayton Community Hall Association (ACHA) was formed. A committee of villagers took on the job of organising the Association, with the long term task of creating a ‘small but modern centrally situated hall’. The Church agreed to sell the hall to the Association for a nominal £100, but it took around three years to sort out various legal and ownership matters before the hall finally became the property of the Association. In those three years the Association became a Scottish Charity (SC 037032) and set about thinking how best to develop the hall as well as embarking on a fund raising programme. The first ideas for the hall involved building a larger one on ground at the rear and incorporating the existing building, but after an application from the Lottery Fund was rejected it was decided it would be more realistic to modernise the building within the existing walls and this is indeed what happened. In May 2013 the Association was granted SCIO status by OSCR, the Scottish Charities Register. SCIO stands for Scottish Charitable Incorporated Corporation. We are now known as Ayton Community Hall Association SCIO. 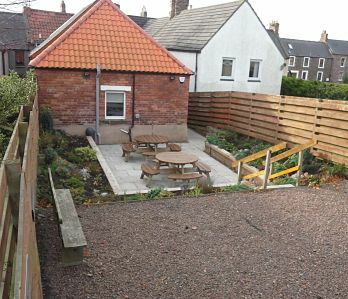 In 2014 a gas barbeque was installed in the patio area and the hall was equipped with WiFi. To find out who is an ACHA Trustee, click here. To see ACHA’s accounts click here. ACHA organises a monthly ACH 100 Club Draw. For more information, click here. For information about hiring the hall, click here. For a page about the history of the hall, click here. Why not help us by becoming a member? For more information, click here.